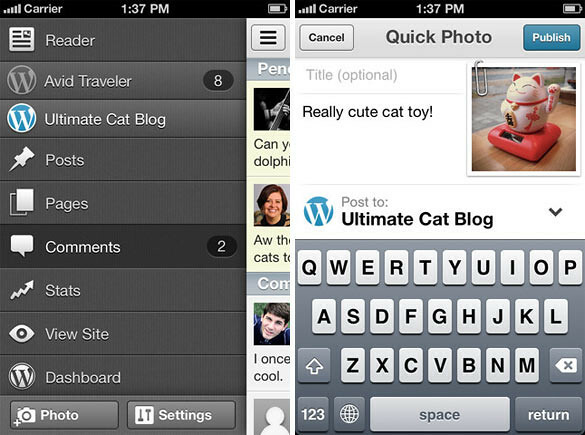 The WordPress app for iPhone and iPad recently got updated with a totally revamped interface. 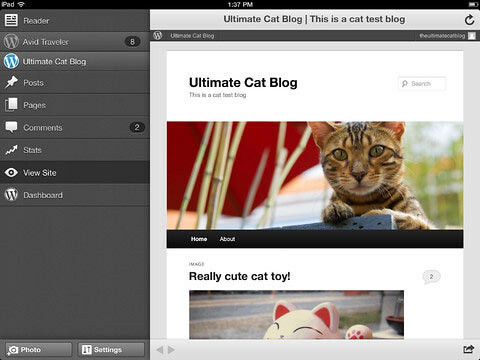 It’s easy to manage your WordPress blog or site from your iOS device. With WordPress for iOS, you can moderate comments, create or edit posts and pages, view stats, and add images or videos with ease. All you need is a WordPress.com blog or a self-hosted WordPress.org site running 3.1 or higher. – New sidebar menu for quick navigation. – Sliding panels on the iPad for greatly improved navigation and ease of use. – Updated colors and graphics. – Improved sign up experience. ★ Support for Post Formats. ★ WordPress.com Reader and Quick Photo added for the iPad. ★ New Simple post preview feature for the iPad. ★ New WordPress.com Friend Finder feature helps you find your friends blogging on WordPress.com. ★ Landscape orientation support throughout the app. ★ Easy access to your site – view it and access the web dashboard right from the app. ★ Last but not least – many reliability improvements and performance tweaks.